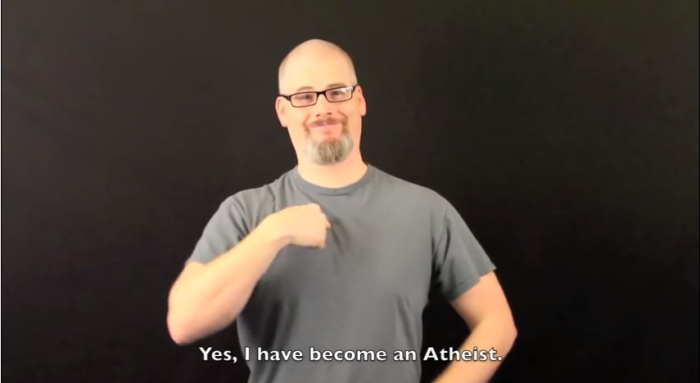 Justin Vollmar, a pastor who has been running the Virtual Deaf Church online for the last four years, made a shocking announcement to his followers Friday declaring he has become an atheist because there is "NO GOD" and Christianity is "all nonsense." Vollmar explained his decision in a blunt and blasphemous YouTube video Friday during which he renounced Christian teachings of the existence of the Holy Spirit, Jesus is the Son of God and that His mother was a virgin at the time of His birth. "This may shock you completely," signed Vollmar in the run-up to his revelation made through subtitles. "Yes, I have become an atheist." "Atheism mean[s] I believe that there is no God. Yes, God is just an illusion or theological concept. Jesus is not the Son of God, He did not rise from the dead. Nor is He born of virgin mother. I completely deny those," he continued in the video. "There is no such thing as Holy Spirit. Word of God is NOT inspired God-breathed book. Church is completely men's invention. All I believe previously as a Christian have been…has been turned upside," he said in complete renunciation of his faith. He said the decision came "after a long and mighty struggle" during which he sought clarity by enrolling in a Master of Arts program of study in theology. The clarity, he explained, resulted in the "profound wonderful change" in his life. "My mind just completely shifted to the other side. So my integrity did not permit me to continue," he said of his "de-conversion." He has since joined forces with the Clergy Project, a confidential community of 556 preachers who no longer believe in God, some of whom are still leaders of Christian congregations, according to the website. There is "NO GOD," reiterated Vollmar to his followers near the end of the video. "It is all nonsense." Since his declaration, Vollmar has been receiving much praise from atheists for his bravery, honesty and enlightenment online, where his decision has sparked a mostly cordial discussion. "The Bible is the reason for my atheism too," wrote one commenter on the YouTube video identified as AlwaysThinkForYourself. "A Christian for 32 years! Then decided to devote the past two years to studying the Bible in extreme depth. Then realized it was all fake and the prophecies for Jesus go against the Tanakh. And the god in the Tanakh contradicts itself. And the science and math in the Bible is totally contradictory to reality. In the end, my little Christian family, we're all atheists now," the former Christian added. "You can't hear a thing but I have a feeling the music will sound a lot clearer than it used to. The only sad thing is the countless others who have disabilities that religion takes advantage of to feed them false hopes in preparation of an early death where they will never self-actualize. I hope you become 10x more evangelical about your atheism than you were about your Christianity. The world needs people like you," wrote Liliy White in a message to Vollar.